ERP enova365 Helps Manage Your Company or Institution. 88% of enova365 users would recommend it to other companies. Get new opportunities for your company – join the 13,000 organisations that use enova365 ERP systems in their daily operations. 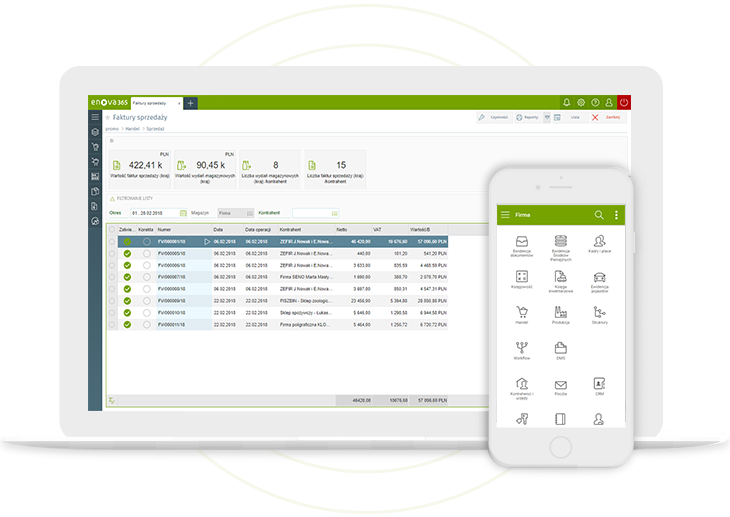 Take advantage of the potential of your ERP software anywhere and on any device. Access your company’s information whenever you need it. Control all business results from anywhere! The enova365 business management software adapts to your company. You can choose the functions and they will work together to support all areas of your business! The systems will adapt to your organisational structure and evolve with it. Pick the management system which perfectly matches your needs! The enova365 system is regularly updated to changing legislation. We care for the quality of our product, which is why your ERP business software package will include access to expert knowledge in management, accounting, HR, and salaries. You can run your business with no concerns and put your trust in the experts, who ensure compliance with the Polish legislation –all included in the cost of a system update! Thanks to the applied technology, the enova365 system integrates with professional software. We design dedicated solutions in cooperation with banks, printer manufacturers, e-document storage systems, or time tracking systems. Your company can focus all of its operations in a single ERP application! Grow your sales with innovative tools, which you can share with your business partners! Keep records of communication with your clients, conduct campaigns and projects together with your business partners – all in one place! 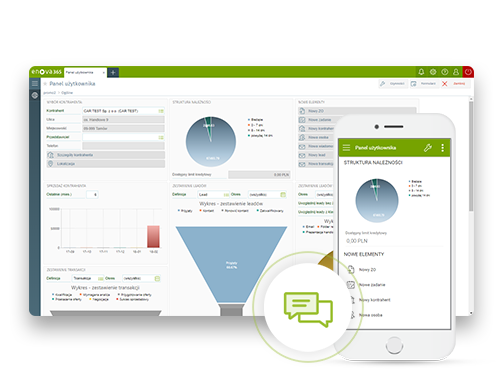 Monitor and analyse your sales leads at every stage of the sales process thanks to sales pipeline support. Take advantage of the convenient CRM on the road and during meetings with your clients –use our mobile application and dedicated features of enova365. Plan and supervise order, commission, and storage handling – all information in a single application. 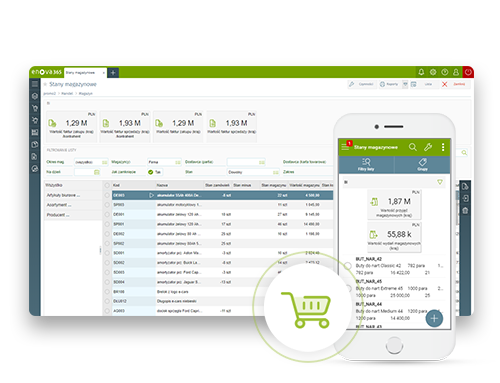 Give an order handling platform – the Business Partner’s Panel – to your clients and suppliers. Take your business relations online! Register commissions and handle orders automatically, directly in the enova365 system. Manage your storage houses and control their stock with a real time view, also available on mobile devices! Recruit and manage your human resources with a system ensuring compliance with the Polish law and current HR trends. All information about your employees – analyse the career and training progress. Monitor the working hours in one place. Give your employees portals for self-service and minimise the workload of your HR department – automate the workflow of employee applications (vacations, business trips, substitutions). Manage the working hours and salaries and submit declarations with a system ensuring compliance with the provisions of the Polish law! Efficient accounting management support systems – keep your books in a system which always conforms with the law. 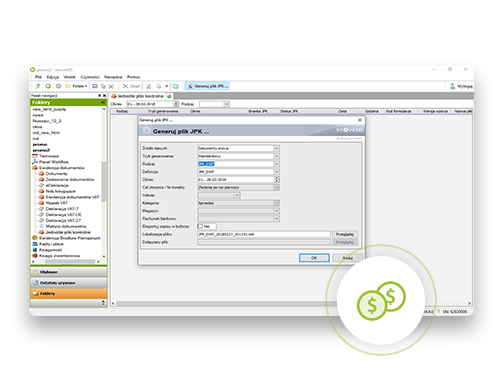 Send JPK files directly from the system by taking advantage of its engine that verifies the correctness of the data. Generate and send eDeclarations. Carry out banking operations directly in enova365 – without the need to sign into your online bank account. Take advantage of our smart system – settle accounts and manage outstanding payments – all in a single view. Improve key processes and ensure their optimal progress in your organisation. The special business software will ensure efficient workflow. 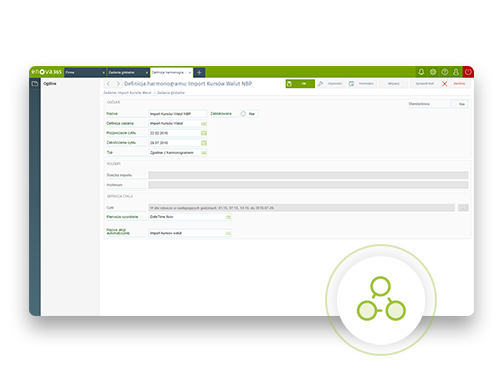 Merge business processes and automate tasks at every stage. Let your employees focus on things that are most important. Leave all redundant tasks to the enova365 system! Support all processes of your organisation with the DMS (Document Management System) system. Check the status of all processes and monitor their progress – learn how your employees perform their tasks. Access information from the analytical reports of enova365 – evaluate performance indicators and make the right decisions. Analyse the condition of your company – gain access to data in a table and chart format within your BI panel. Create custom indicators and reports based on any data in the system. Share the indicators with your employees through the application – in real time. We are the developers of enova365 – dedicated ERP business software. Our company is made up of experts and people with a passion, who have been working in software development for over 20 years. Soneta has made a stable position for itself on the Polish market, is a valuable business partner, and a stable employer. The company is also involved in social assistance, which includes its employees and partnership network. Our goal is to maintain a stable position among the most popular and respected providers of IT solutions for Polish companies – in scope of management and finances. We are not driven by the demands of the market alone. We want to anticipate them! The Company’s success comes from the collective efforts of its employees. It is their approach, skill, and involvement which lets us reach the planned objectives. Besides being a business software developer, we also want to serve as a business consultant. We want to lead our Partners and Clients to new technological solutions by showing them specific business benefits. We focus on partnership in both business strategy (Authorised Partner network) and relations with our Clients, Employees, and business associates. We are at your disposal and waiting for your call. We are among the most dynamically developing companies in the country! We are among the leading providers on the market!